Q. 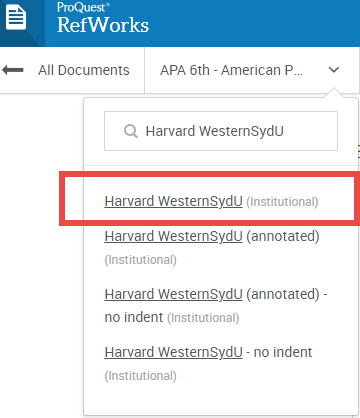 How do I set my referencing style to Harvard WesternSydU in RefWorks? I am using ProQuest RefWorks. Log into RefWorks. Make sure to use your institutional email address if you are creating an account. On the tool panel, click the quotation mark icon and select Create bibliography. On the tool panel, click the downward arrow icon and type Harvard WesternSydU into the search box. Select the version you would like to use. Your bibliography will generate in Harvard WesternSydU style. Follow the above instructions to set Harvard WesternSydU as your referencing style in RefWorks. Download Write-N-Cite for Word. If you already have Write-N-Cite installed, click 'Sync My Database' in the RefWorks tab to bring across recently used styles. In the RefWorks tab in Word, click the 'Style' drop down and select Harvard WesternSydU from the list. Your inserted citations and bibliography will generate in Harvard WesternSydU style. For further information on RefWorks including using Write-N-Cite with Word to write and format your paper, please refer to the instructions in the New RefWorks LibGuide.